Florida residents Mary and Larry Anderson have just completed an exciting project: a new 9,000-square-foot waterfront house in Jupiter, Florida. The dream home features a four-car garage, guest house connected by a breezeway, dock, expansive landscaping and distinguished copper roofs. It also features a Bellaforté Shake roof in Mountain VariBlend. 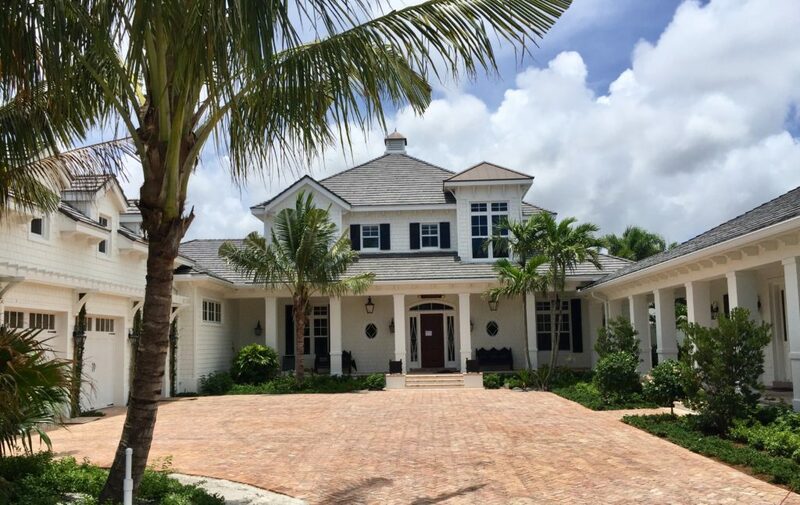 A key element of the selection of DaVinci roofing for this Florida coastal design home (which boasts touches of Martha’s Vineyard and the Hamptons style architecture!) was the product’s ability to meet stringent south Florida building codes. Rated to withstand winds up to 110 mph, the Bellaforté Shake roofing product is also Class 4 impact rated and meets Class A fire resistance standards. The one-inch tile thickness and 12-inch tile width provide an authentic replica to real cedar shakes, except the faux shakes resist cracking, fading, mold, algae, fungus and insects.